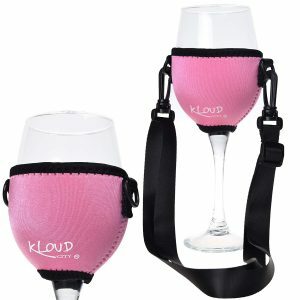 Grab this Wine glass insulator for that special lady in your life that loves her wine. Everyone knows at least one! Beer koozies have been around forever and yet all the wine drinkers have been out of luck. Finally, this wine woozie comes to the rescue! Made of neoprene, this woozie is easy to grip, soft to the touch, insulates your wine and above all else – looks pretty good too! No more guessing which glass of wine is yours if you have one of these! this is great for a wine lover. It is cute and very handy. I see people use it all the time now. Can be a bit small with some wine glasses. If you can’t think of anything to give the wine drinking Diva in your life, this is it.